...not to dream less, but to dream more, to dream all the time. All cons have their post-convention ambition-peak, and Mysterium has been no exception. -Work on outreach to get people who liked Myst but are not In Myst Fandom TM to feel welcome and interested in the forums, Mysterium, fanart, fan projects, etc. If I only accomplish half of that, I'll still feel pretty awesome. And I think it's doable! -dreaming of making some sort of amazing collaboration with the two above fans! -not wanting the con to be over early for me! (though hanging out with non-fandom friends in Seattle was definitely a good thing.) Next time I'll be there for the whole thing! Originally posted at purpleshiny.com. Feel free to comment here or there. I've been accepted as a new member of Boston Handmade, a group of local crafters who support each other in their endeavors. I've been a fan of their blog for ages, so I'm excited and nervous at the same time to join such awesome artists and entrepreneurs. I'll be writing articles for their blog soon! 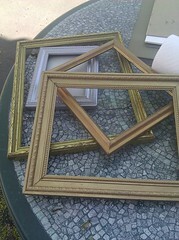 ALSO, I'll be vending at Boston Handmade's Summer 2011 Somerville Marketplace, in Union Square. It's happening on July 30th, from 3pm to 7pm. 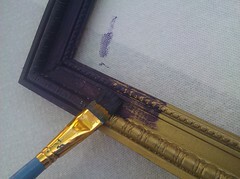 Stop by and see me and my fellow local artists--I'll have shiny things, and there'll be live music! Hey, remember these shiny pendants? 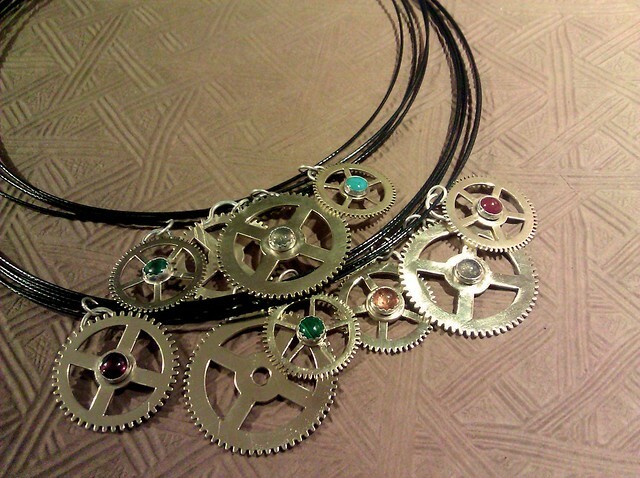 They're now up in the "Gleaming Gears" section of my shop. I'm definitely happy with my lightbox. From now on, I'm going to take nice-looking photos as soon as I finish things, so there's not so much lag between when I make things and when they go online. Most of my bench time right now has been focused on some custom orders, but I'm also thinking about new jewelry designs. I'm playing with ways to use some of the great gemstones in my stash as well as some of my silver scrap. 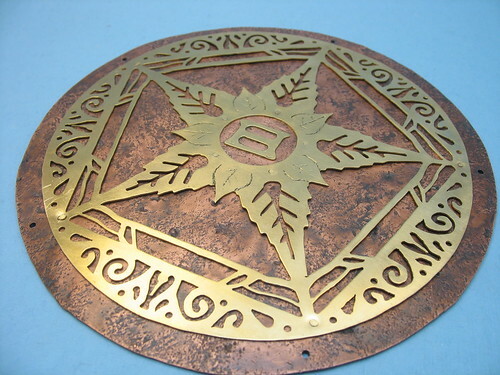 I finally made a project involving metalwork AND Myst fandom. And it couldn't be something simple and easy, oh no. This is the sort of project that, if someone came up to me and asked to do it on commission, I'd laugh them off of the internet unless they were offering me thousands of dollars. But apparently my stubborn fannishness for Riven is enough to keep me working away for two and a half solid days! Looking at my blog archives, it's been over a month since I worked on a project that required much complex soldering. Now I'm working on a commission that involves a bunch of tiny, multi-step soldering, and it's been great getting back into things. I do love the cold metalwork techniques I use, like sawing, filing, and especially texturing/hammering. But I think I love soldering even more. I love the nerve-wracking moments where I'm holding my breath to line the solder chips up juuuuust right. The torching, where I first gently heat up the metal, then bring the flame close and fast while praying the little delicate bits of silver and gear will get hot enough to meld with the solder, but not melt into a puddle. The hiss of plunging the newly-soldered piece into the quenching bowl. Turning the newly-fabricated thing over in my hands, tugging at it to be sure the pieces have truly joined. I even love smelling the vinegar working away at cleaning something I've just soldered together, and I normally hate vinegar! There are a few things about soldering that I can tell I've gotten rusty at over the last month without it. I overheated the back of this little prototype pendant, so there's an unsightly blob of silver on the reverse side. 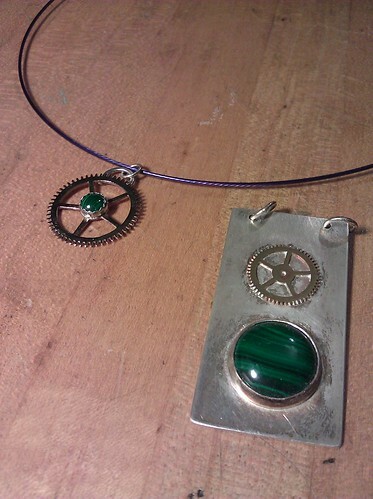 I'll be keeping this pendant for myself for that reason--it's wearable, but not up to my standards for selling. I think that a teeny bit of practice will get my heat control back to its normal form, and I can't wait to do more and more soldering! Yay playing with fire! At almost the last possible minute, I decided to bring something unusual (for me) to International Steampunk City: a box of watch parts and other supplies to sell to steampunk fans on a pay-what-you-like-or-can basis (which worked out in the end to an average of 45 cents per thing--almost certainly less than I paid for most of the bits in the box). Read on for why it made sense for me to get rid of a huge swath of my carefully-accumulated stash. The impetus for this destash was me realizing that some of my supplies were not quiiiiiite right for me. 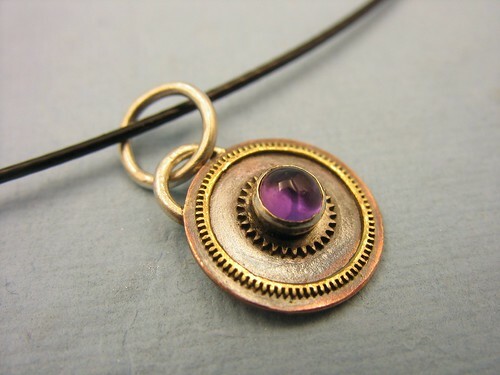 In the time since I acquired them, I've been moving my jewelry away from assembling existing bits together in novel ways, and towards metalwork pieces that I fabricate myself, with watch parts incorporated the way one might incorporate gemstones or wire filligree. This distinction may only make sense in my head, but it's a big deal to me. 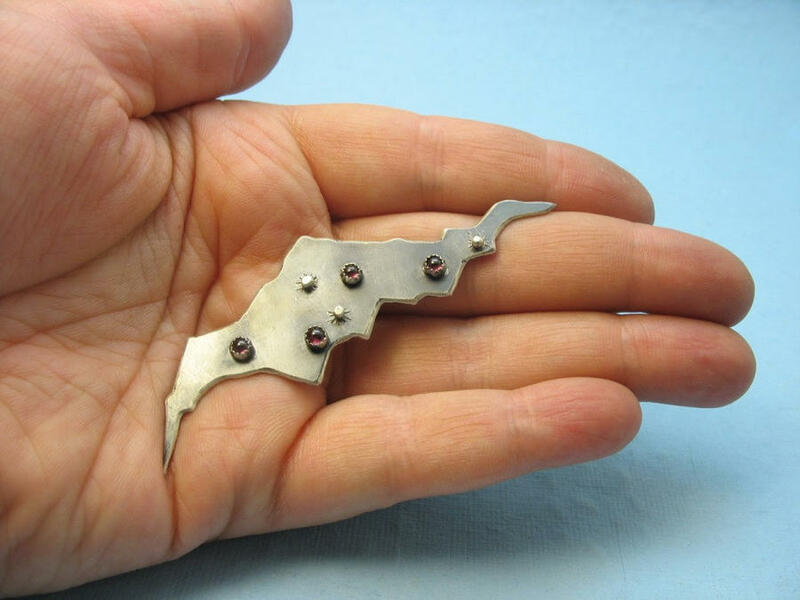 This is the way of making jewelry that I find really exciting and fulfilling--and there's a narrower range of parts that I'm interested in incorporating this way. Life is too short for supplies that don't light you on fire with inspiration! Once I realized this, I knew I needed to move a lot of my stash out from my workshop as efficiently as possible. I wanted to free up both physical and mental space so that I can focus on the components that fill me with joy (and that touch of slightly-fearful awe that propels me to improve my craft to be worthy of my materials). 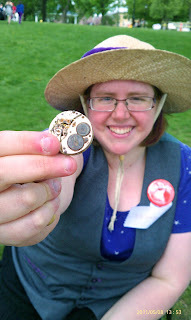 The deeper reason for bringing the box of supplies to the festival was that I wanted to connect with other makers and tinkerers. 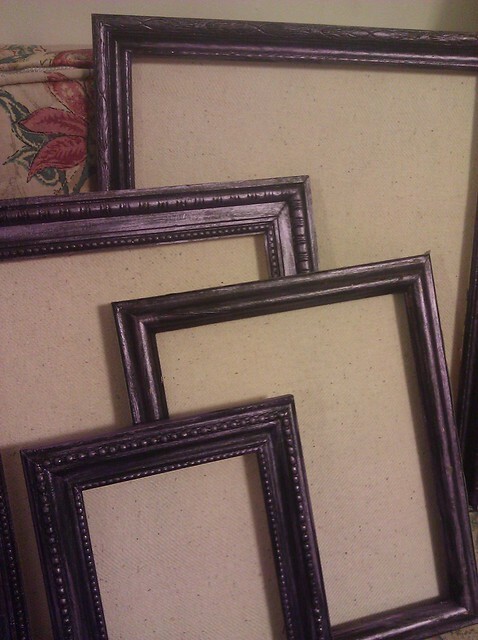 It's no secret that I like geeking out about making things! And what better outlet for unwanted parts than folks who are dying to get their hands on that sort of thing and build something cool with them? 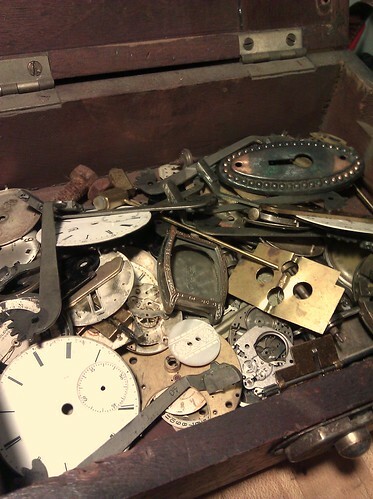 I was so happy to give people a chance to sift through a box of interesting stuff that I knew they could use. I hope that some of the 30 or so folks who took supplies home with them will speak up in the comments section! Tell me about the projects you're thinking of, or link to pictures of any work-in-progress or finished contraptions. I know I can't wait to see what you come up with! I'm still trying to clean up my living room and studio after the chaos of last weekend's con... but I managed to clear off the secondary studio table and construct a primitive lightbox. A lightbox is something for diffusing and reflecting light for getting better macro photography. 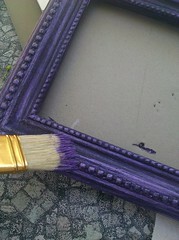 There are plenty of online tutorials for making them (the one I made was similar to this or this). I also started exploring some of the manual settings on my digital camera (it's a Canon Powershot A610). I still haven't figured out the best combination of settings, and I'm thinking of switching to a more neutral background--but as you can see, it's possible for me to take clear, adequately-lit photos with my camera and this lightbox. 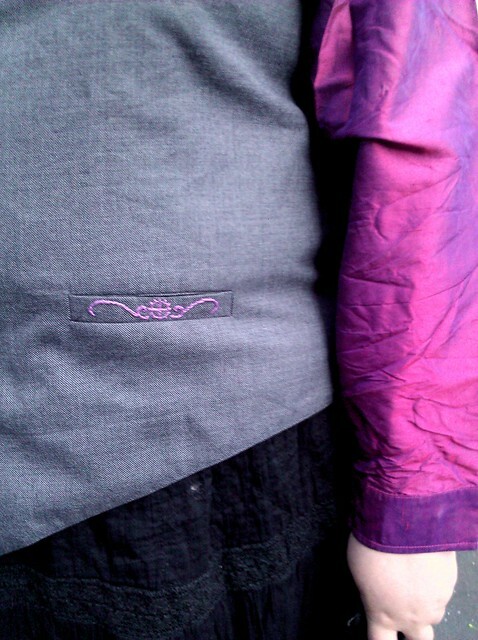 That means I can take Etsy photos without regard for the time of day or the weather! 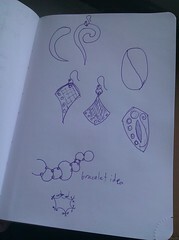 This makes the idea of working through my backlog of jewelry to list it a bit less intimidating. 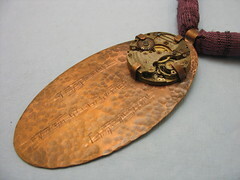 At ISC, for the first time EVER, I made a pendant from start to finish as a demo for all passersby to watch. I cheated a tiny bit by drilling one hole in the middle of the copper at home, but otherwise, I did all the sawing, filing, texturing, and oxidizing right there on the Waltham common. I sat in a folding chair and used a short four-legged stool as my work surface, with a bench pin clamped to its edge and my adorable little anvil on top of it. I was really worried that it would rain again on Sunday, but the weather luckily cooperated throughout the demo. It was a little windy, but no rain, thank goodness! I had a bunch of opportunities to talk to a wide variety of people--some of them steampunk fans (in costume or in regular clothes), some slightly-confused Waltham residents, some curious folks from all around the Boston area who stopped by to check out the spectacle. I realized that I wasn't going to show a fixed group of people the entire process of making a pendant, but would be giving them snippets of progress on the project throughout the afternoon as they wandered the common, taking in the sights (including a blacksmith's shop, high-wheeled bicycles, and a parade!). My spiel was something like this: "Hi! I'm a steampunk jewelry artist, and I'm giving a demo in this lovely weather. Here's an example of a finished pendant I've made. Here's how this one's coming along. 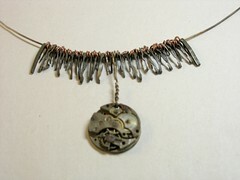 The pendant I'm making this afternoon is going to have this Waltham Watch Company watch movement as its focal!" (This spiel would, of course, be modified if I realized that the other person had no idea that there was a festival that weekend, or even what "steampunk" was supposed to mean.) Then I'd talk about the step I was working on, and point out how the finished example was constructed. The project will take at least 3 times as long as it normally would if I were working alone in my studio, what with all the pausing for conversation and the somewhat unfamiliar workbench setup. Sunscreen next time I do this outdoors! This time, doing a demo on the common (away from my table in the Watch Factory) was the right call, but anytime my table is less distant from the main hustle and bustle, it'd be better to set up shop closer to my table with finished jewelry for people to look at. Don't accidentally set up shop along the path of the ENSMB-led parade! 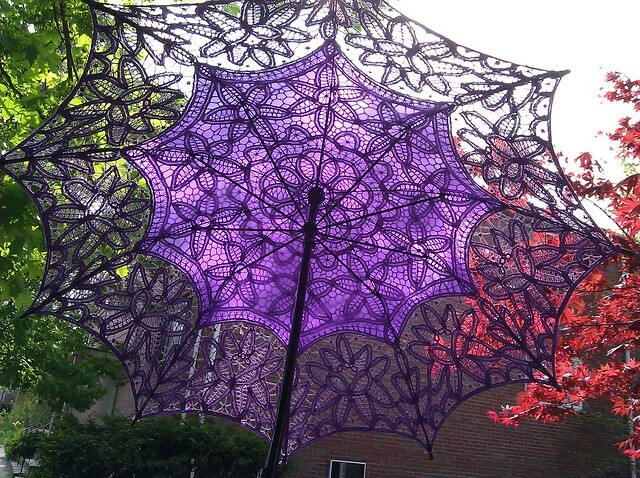 The purple parasol was a great conversation-starter, even though I'm not a parasol-maker. People were pretty amused by my story of bartering jewelry for it at Strowlercon. Take a photo of the finished product! 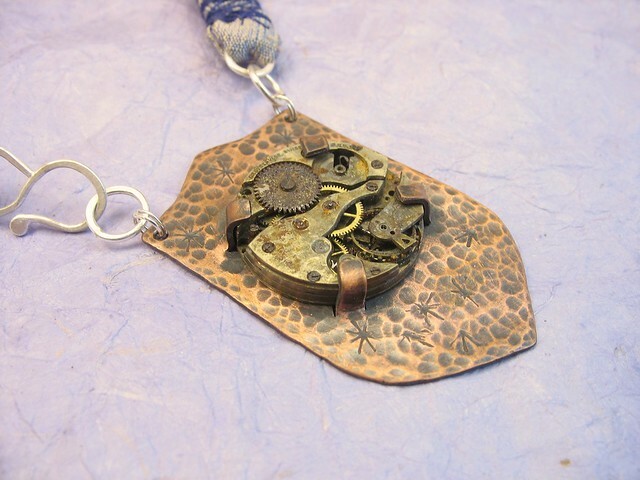 I sold the pendant immediately after I finished it, and I really wish I'd thought to snap a photo. But it was another piece in the same mode as these guys, which I'll be listing on Etsy as soon as I can get my act together. 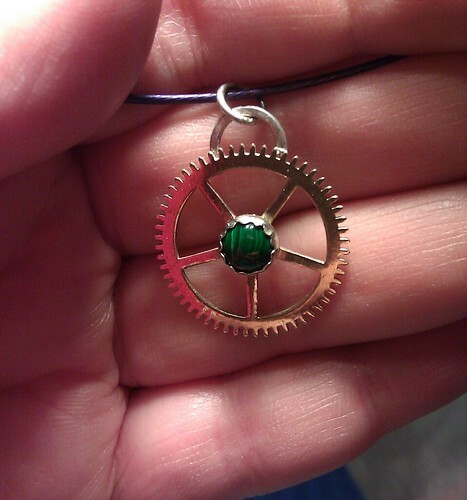 After I finished the pendant, I packed everything up into my little shopping cart and walked back to the Watch Factory. I remember feeling an immense joy and gratitude. Joy from the lovely weather, the connections I made with interesting people, and the thrill that always accompanies making things with my hands. Gratitude towards so many people who helped me vend at the convention in big and small ways: Susannah, for putting up with my crazy whirlwind of preparation, being there with me every step of the way for the weekend, and watching the table while I was at the demo; Alex, for driving me and my stuff there; C for playing her fiddle on Saturday afternoon; Jer, for carrying my folding chair from the demo to the Watch Factory; Susannah's parents for driving us home. I really felt like, in spite of the stress and the hard work, that undercurrent of purple-tinted enthusiasm was still with me after all. Such a marvelous feeling! Now if only I can recover from this cold quickly and build on this momentum! You know how sometimes in college, you'd come down with a cold as soon as finals were over? I think that just happened to me, but after vending at a big show rather than taking finals. [purpleshiny.com] Final outfit for International Steampunk City! 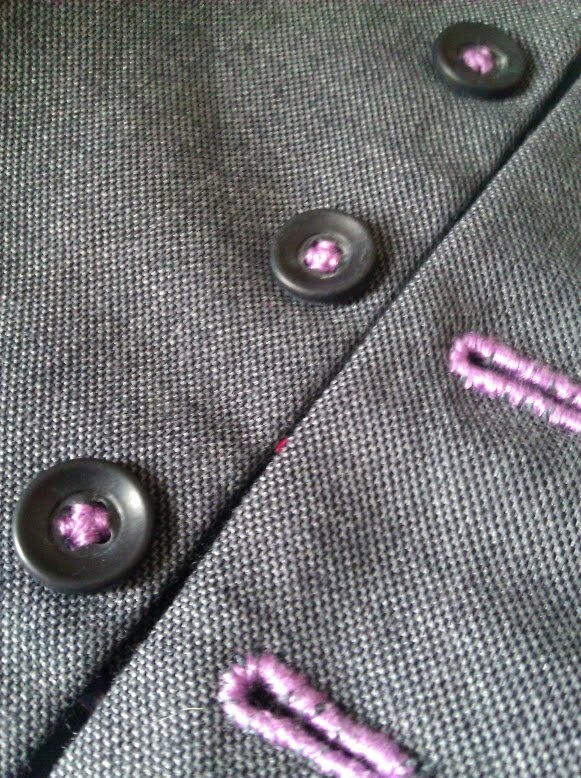 There are a bunch of neat little details in this costume that I'm really proud of. A few years ago, as I was first learning about the steampunk aesthetic (discovering great artists like Datamancer), I briefly became obsessed with turning a mechanical typewriter into a musical instrument. (Something more melodic and standalone than the Boston Typewriter Orchestra.) My plans ranged from using digital sensors and synthesizers to rigging up some kind of pulley and chime system. Suffice it to say, my interests and skills have since wandered in another direction, and I'm trying to let go of plans that clearly aren't meant for me. Since I'll be surrounded by steampunk fans when I'm at International Steampunk City, I thought it would be a good place and time to try to find a new, loving home for this cool piece of machinery. So during the convention, I'm giving it away for free. It'll go to the first interested person with good intentions for the typewriter who shows up at my table and asks for it. My booth will be located in the Waltham Watch Factory building, right next to the festival's opening ceremonies and many exciting performances. I'm not going to let anyone put a claim on it ahead of time--just show up! If you're interested in it, there are a few things you should know: First, the condition it's in. It's missing its ribbons (so you can't type with it right now), it's dusty inside and out, and some of the keys stick (but no parts are missing as far as I know). I suspect that Cambridge Typewriter could clean and repair it, but I claim no knowledge of typewriter mechanics, and it's possible it won't be simple to restore to perfect working condition. Second, it's pretty heavy. A cart or dolly of some kind would be ideal, but carrying it a short distance to a car (pausing frequently to set it down and rest) would probably work too. Please don't plan to walk miles and miles carrying it in your bare hands! PS: While I was writing this post, I discovered that Cambridge Typewriter has an active blog about the machines and goings-on in the shop. Some of the typewriters pictured are absolutely stunning, like finely-restored vintage sportscars. 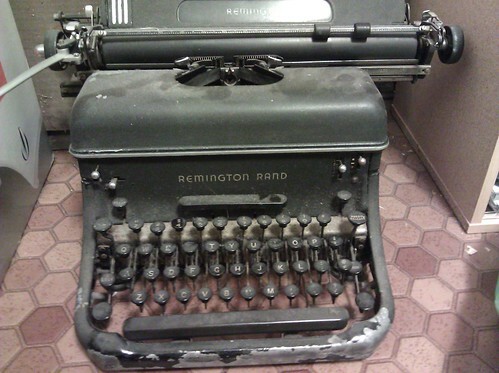 I could really get into typewriter collecting if I had more space in my apartment! 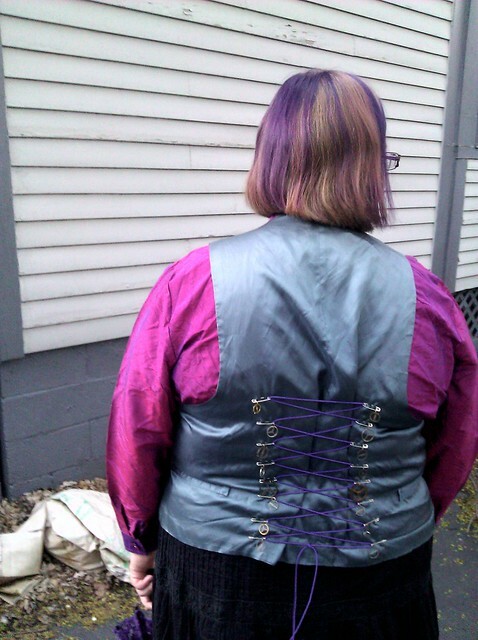 I took a break from metalwork this weekend to think about my costume for International Steampunk City. I hadn't really been planning to dress up much--just a skirt and stripey socks or something. But then I realized I could make some purple steampunk modifications to a men's vest I picked up at the Garment District a month or two ago. And a vision of an outfit sort of spiraled out from there. Here's a glimpse of how it's going--the most exciting modifications are still in the works. I don't do a lot of sewing and embroidery normally, but I'm figuring it out. I keep thinking of The Tailor of Gloucester as I stitch and monitor my supply of purple thread--hopefully my housemate's cat won't hide the last bits from me! I'll definitely post photos of the finished costume, hopefully a few days from now. Halp! Can you drive me to Waltham in May? So vending at International Steampunk City is (obviously, given the flood of posts from purpleshiny.com) super-important to me, and coming up in just a couple of weeks. I need to get myself, my items, and my folding table to Waltham on Friday, May 6, and back home again on Sunday, May 8. The earlier on Friday and the later on Sunday, the better. In the worst case, I can take a bus with a couple of helpers and haul things, but having rides would make things so much simpler. Is anyone I know with a car planning to go anyway and willing to take on a passenger and some stuff? [purpleshiny.com] Bwahaha! A pile of shinies! These don't have much story to go with them, but they look so awesome that I don't care. Heeheehee. So that's TEN pendants, most with gemstones and a couple without. There's amber, turquoise, garnet, malachite, labradorite, and carnelian in here. I'm contemplating doing a couple more with larger amethysts in the middle, too. Hmm, I should make improving my light box (for taking nice photos in the basement studio) a priority after ISC. When I've just completed something, I'm so full of amazement at what I've done, so proud that I've managed to wrestle some scraps of metal into the shape and finish that I wanted, that I'm eager to take photos. It's like, I don't know, taking pictures of your favorite kitten or something--so much fun you can't even fathom not wanting to do it. When I save up new pieces to take a ton of pictures on a sunny day, that's when it feels like a chore. Good to know! Oh, and ISC had some kind of website problem. 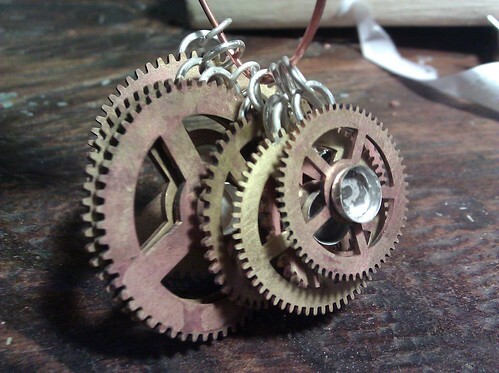 Their website is now here: International Steampunk City Waltham. 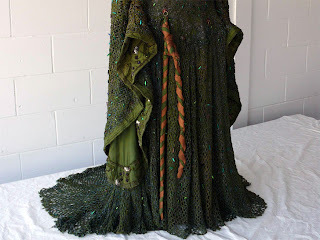 I recently read about the restoration of this Victorian dress, which is covered with real beetle wings. It grabbed my interest because I've been using beetle wings in my jewelry for quite some time--looking at my Flickr log, since at least March of 2008. I love their brilliant, iridescent colors, and their feather-lightness makes them perfect for earrings. So it was really cool to learn a bit about an important piece of fashion history that also incorporated the same kind of beetle wings over a hundred years ago. I started out online in Myst fandom. And for me, it wasn't just about the games and books--it was about worldbuilding. Imagining Ages of my own; filling journals with detailed plans and maps and sketches; rendering them in Terragen or Blender. Making islands in my head and on my computer. I haven't actively worked on digital worlds in a long time, maybe because working as a programmer makes me want my hobbies to take me away from the screen. 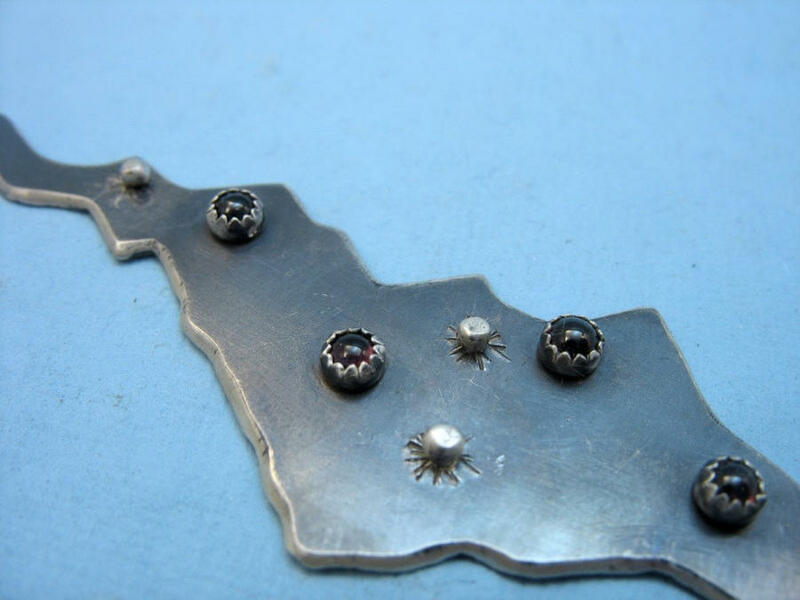 But I still love the idea of making worlds, and try to work it into my metalwork whenever I can. 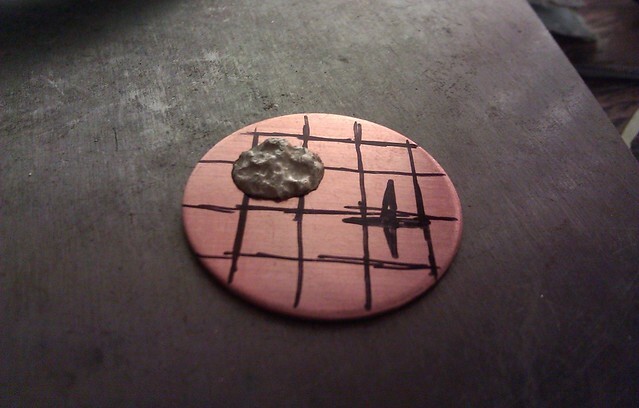 Yesterday, I tried out my new crucible by melting down scrap and pouring it onto salt to make a textured silver blob; tonight, I sawed that blob in half, so that the interesting half can be soldered onto something. Something maplike, probably. I don't know exactly what it'll be; the sharpie doodles on the copper in the picture are just the visual equivalent of thinking out loud. But the silver reminds me of a continent rising out of the water, and it makes me so very happy to be building islands again.